Please consider donating items or volunteering to serve for the next meal Overbrook will be providing at the YWCA Family Center (on the second Sunday of each month). A list of needs for donated items and volunteers is posted every month next to the bulletin board outside the Parlor. Volunteers can meet at the church at 4:30 PM to help carry supplies or meet at the center to prepare for serving at 5 PM. Please consider how you can join in helping these displaced families. The YWCA Family Center offers homeless families safe comfortable accommodations and child care for families in Franklin County who are experiencing an immediate housing crisis. Professional staff offer an array of services including employment assistance, case management, housing placement, child advocacy, after school programming and daycare. Overbrook has provided the evening meal on the second Sunday of every month since the Center opened in 2012. 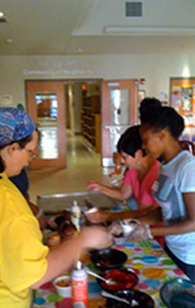 A simple supper made up of child friendly foods including hot dogs, baked beans, applesauce, carrots, bananas, apples, oranges, salad, Jell-O, and potato chips makes up the Overbrook menu. Meals for homeless families are hosted by different community groups and religious organizations every day. Thank you to everyone who signs up to donate food month after month and all the Overbrook volunteers who give tirelessly of their time on Sunday nights. Our efforts are greatly appreciated by the Center and the people they serve. Many, many residents say thank you and one phrase repeated over and over is “this was the best meal I have had since I got here.” The most gratifying thing to all our volunteers is when we ask a resident if they would like “more” and the reply is “Can I really have some more?” Of course, the answer always is “yes, you can have more.” Second helpings are always encouraged. No one leaves the dining room hungry when Overbrook is there!